A few day ago I came across a nice layer by L. Van Warren where he used GoogleSky to plot the relative strength of radio sources in the sky. 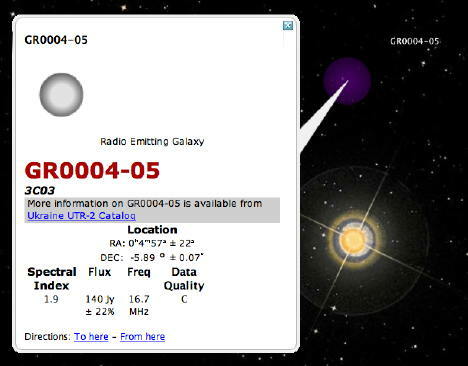 The catalog used is from the Ukraine Russia Radio Telescope Database and I had a brief email exchange with Van to suggest he post the layer on the GoogleSky Community. He did! His post was then picked up by Ogle Earth under a very interesting title: XML. Or, the coming transformation of observational astronomy. Does this mean astronomy is changing? I hope so, but an interesting test will be next week's meeting of the International Virtual Observatory Alliance in Cambridge, UK. I will be there and I will blog about it! The Applications Showcase session is full of interesting talks: GoogleSky is prominent, mostly because it's there now, but I am very interested in what Microsoft is doing with the World Wide Telescope! It's to be noted that WWT was envisioned a log time ago by Jim Gray and Alex Szalay. They were the true pioneers of visual interfaces to large databases! Hi, just saw your post here. I asked Van to post the KML to his site as soon as he was ready. He did, and I used the link from there. (To be fair to Van, he was planning to as soon as it was polished enough -- so it wasn't my idea). He also then posted it to GEC. oh, I did not know... In any case, it's a cool layer!